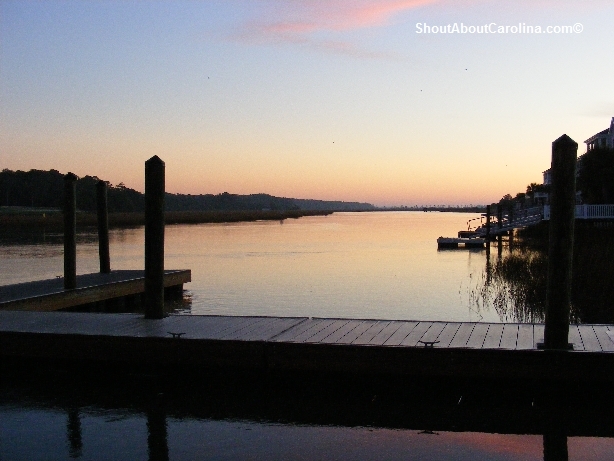 We started out at sunrise and let in at the boat ramp inside Cherry Grove Park adjacent the Heritage Shores Nature Preserve (highly recommending visiting , free admission). 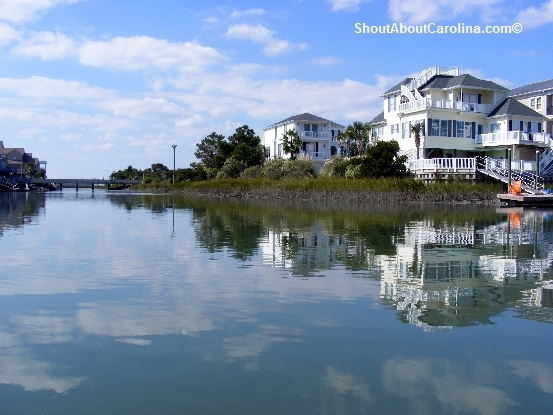 Best way to start the day: going kayaking in the marsh at Cherry Grove Beach! the ocean, we turned around looking for a better way. We found it right across the dock where we let in. There is a mini inlet going parallel to main channel (Go only at high tide to avoid getting stuck in the sea grass or the oyster beds). While my husband guided the kayak at a leisurely pace, I was able to take photos, enjoy the beautiful marsh views, and look out for wildlife. 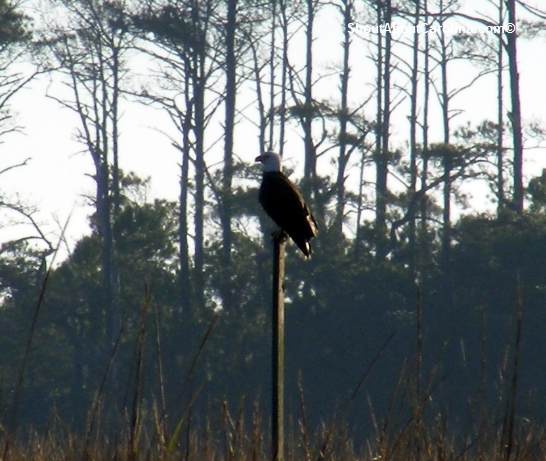 Great reason to go out paddling...a chance to see the majestic American bald eagle! For a long time it stood so still I wondered whether is one of those fake birds you see around the beach. But it did eventually move when we got really close. As I was shooting a video of its huge, beautiful wings in full strike, my batteries ran out…go figure! At least I got some nice still shots. 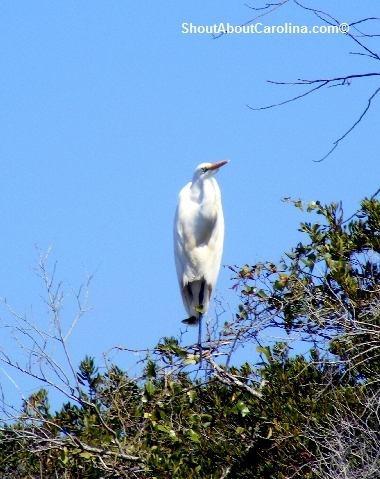 Here is another big bird beauty, a great white egret sitting in a tree in the middle of the preserve. 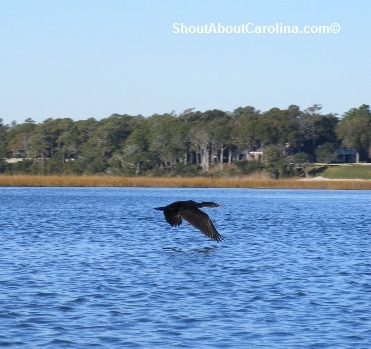 A double crested cormorant gliding smoothly above the water. Did you know that cormorants dive for food and after catching a fish, resurface, flip it into the air and swallow it head first? Our initial attempt to pass “the Gauntlet of Death” (the nickname my husband gave the spot where the inlet meets the ocean and strong waves push against you) failed. 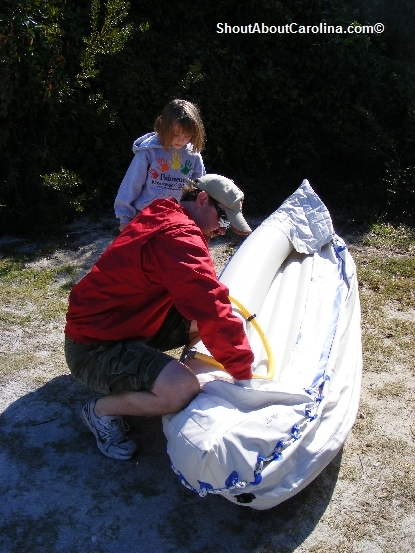 But our second try through the side inlet succeeded with ease. We reached the barrier island and decided to take a break. Another treat in store: bottlenose dolphins feeding offshore. 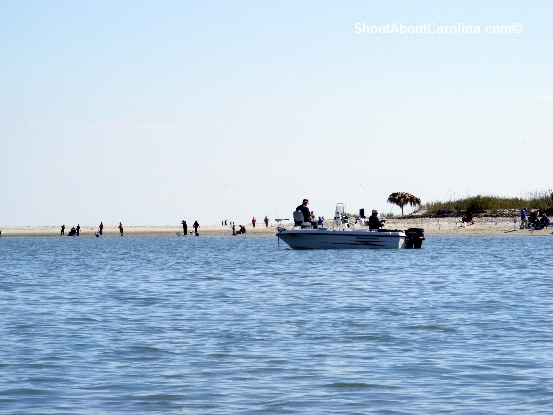 During our extended winter vacation at Cherry Grove Beach we were lucky to see dolphins swimming by the pier almost every day. Here is a memorable video with a pair of dolphins doing a spectacular synchronized jump. What else can you ask for? 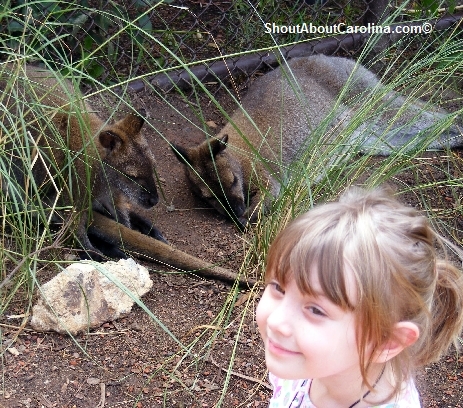 The ocean, sun, amazing wildlife encounters and a healthy dose of exercise at the beach, all free. Happy New Year everyone! 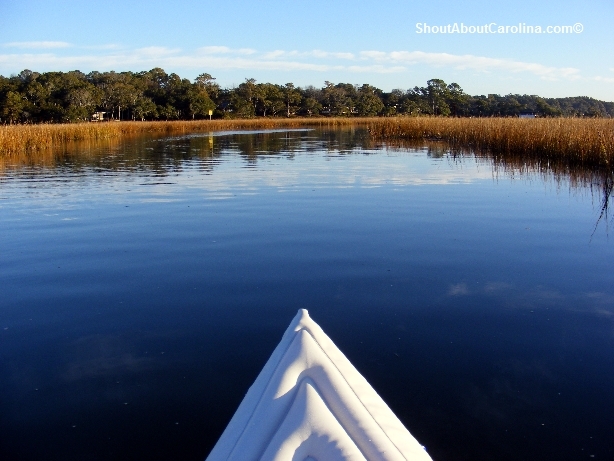 Start a new family tradition this year: kayaking along the South Carolina coast! Few months ago I had the opportunity to visit Dorchester State Historic Park, a short drive from Summerville, the magnificent plantations and North Charleston. 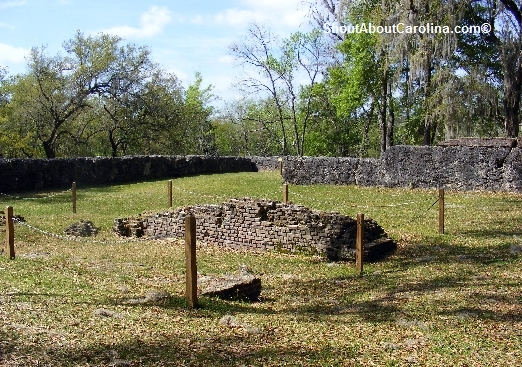 Similarly to nearby Charles Towne Landing, visitors are rewarded with one of America’s most complete archaeological records of colonial life. 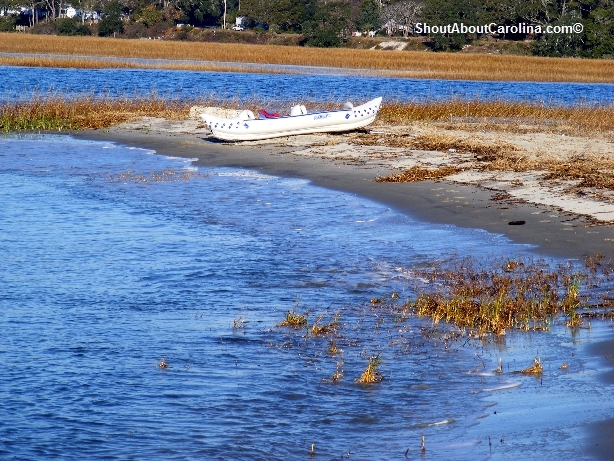 On October 20, 1695, Joseph Lord, Increase Summer and William Pratt were dismissed from their church from Dorchester, Massachusetts for “Ye gathering of A Church for ye South Carolina.” After securing 4050 of land here along the Ashley River, they sailed home to their congregation in New England. They returned in 1697 with other church members who hoped “to go to South Carolina to Settel the Gospel ther”. When the new Dorchester was laid out, the village contained 116 quarter acre lots, a town square and commons. The St. George Anglican church was built in 1720, a fair was established in 1723 and the Free School opened in 1761. By 1781, Dorchester became a booming trade center and boasted about 40 houses by 1781. The town gradually declined after the American Revolution and was abandoned in 1788. The threat of malaria and the shortage of land cause the Congregationalist colony to leave Dorchester and start a new settlement in Midway, Georgia. 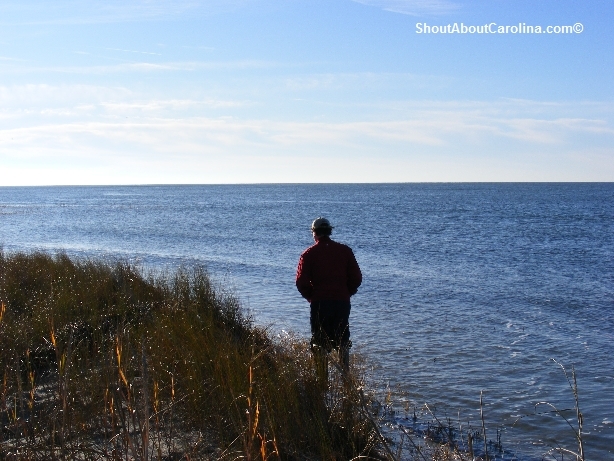 In 1969, the land was donated to the South Carolina State Park Service. The village of Dorchester is listed on the National Register of Historic Places. 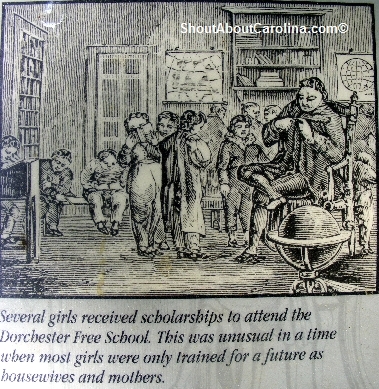 The Dorchester Free School where girls were allowed to attend. Several girls attended the free school, an amazing feat for the time given most girls were raised to become just mothers and housewives. During Revolutionary War the schoolmaster was removed from this post for remaining loyal to England and the school was closed. The British troops burned it down and it did not reopen for almost 25 years. In 1818 the school moved to Summerville. The St. George’s Anglican Church and Bell Tower – Angry with the Anglican Church, the Puritan Pilgrims left England in 1620. St. George’s Anglican Church was built here in 1720. 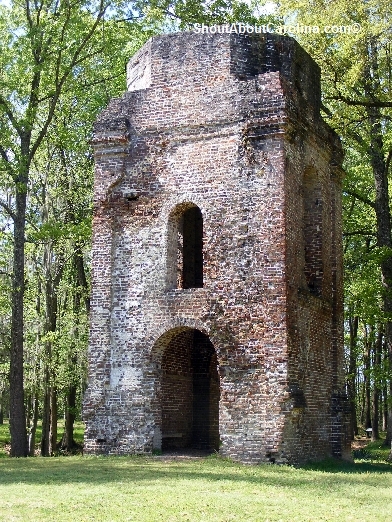 The bell tower was added in 1751. 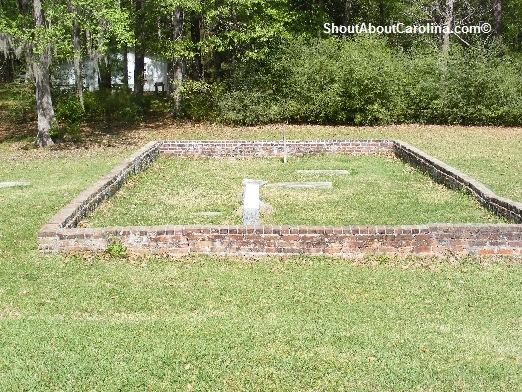 Their descendants, known as Congregationalists, founded Dorchester in 1697, only to endure South Carolina’s 1706 declaration of Anglicanism as the colony’s official church. With the Congregationalists worshiping only 2 miles away, St. George’s Anglican Church was built in 1720 in the center of Dorchester. Village founders and the other village “dissenters” were even taxed to support St. George’s. The church was enlarged in the 1730s to meet its growing and prosperous parish. The bell tower was added in 1751. St. George’s Anglican Church may have been a more convenient location for local worship, however the Congregationalist Church remained the religious center for most of Dorchester’s Puritan settlers. and in 1674 they were even accused of murder. The settlers waged war against the Coosa. 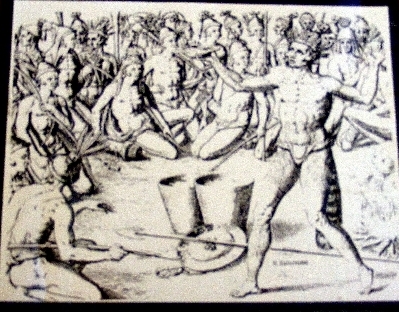 After defeating the Indians, they required a monthly payment of deerskin per colony. By 1696, the Coosa ceased to have a significance presence in this area. Some had settled in the nearby St. Paul’s Parish, some migrated west, others died or intermarried with the English. Fort Dorchester – During the French and Indian War rumors of an impeding naval attack by the French forced swift action by leaders in Charles Towne. A brick powder magazine enclosed by a tabby wall 8 feet high was built here in 1757. During the Revolution, Dorchester was a strategic point. In 1775, the magazine was fortified and the garrison commanded by Capt. Francis Marion. British troops occupied the town in April 1780 and again in 1781. At one point there were over 600 British soldiers in Dorchester. They were driven out by cavalry and infantry under Col. Wade Hampton and Gen. Nathaniel Greene on December 1, 1781. “A single door admitted to a single aisle, leading to a lofty pulpit, with a sounding board above it. In front of the pulpit was an elevated seat for the ruling elder; a little lower and just behind the communion table was a seat for the deacons. On either side of the island were several plain benches, capable of seating four or five persons each. During the Revolutionary War, the British occupied the building and reportedly burned it when they evacuated the area. In 1794 the structure was repaired, and eventually its congregation entered into an affiliation with the Presbyterian Church. As the Dorchester settlement declined and the town of Summerville grew, a new church was constructed nearer the town. Over time the old meeting house fell in disrepair and in 1886 it was severely damaged by the Great Earthquake. Today, only crumbling walls and the burial grounds remain. The Artifacts – At the center you can see numerous artifacts such as hand painted pearl ware, Staffordshire candle holder, lead-glazed earthenware, white salt-glazed stoneware and the Colono ware. The Colono ware is similar to pottery from Nigeria and Ghana. 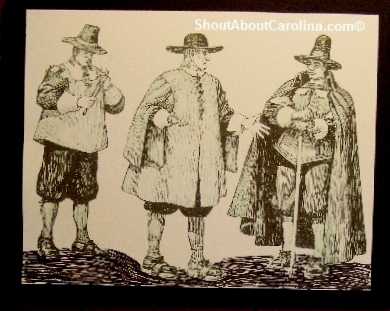 It started to be produced in Carolina around 1680, peaked in the early 1700s and then disappeared by 1800. Typical vessels were flat bottomed, burnished, grit-tempered and often had an “X” incised on their bases. 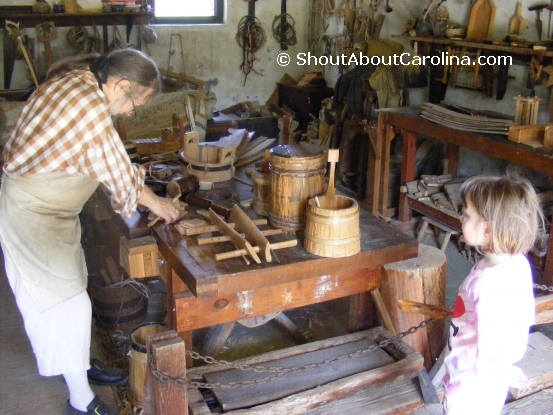 Step back in the colonial period at Dorchester State Historic Park! 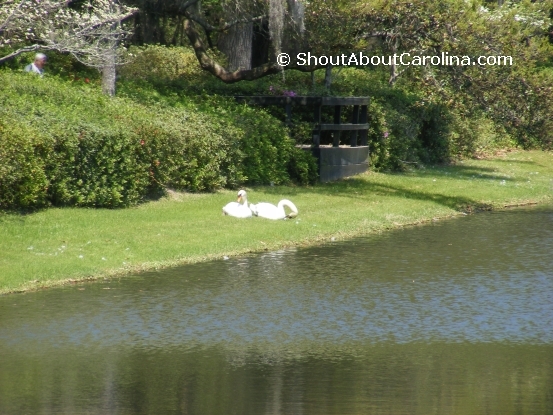 This year we started our Charleston spring vacation at Middleton Place. It was the fair thing to do, since last year we visited Magnolia Plantation. Respect the dandy Stableyards keeper! Middleton Place is more expensive ($25 adults / $5 children 7-15 general admission vs. $15 adults / $10 children 6-12 at Magnolia). 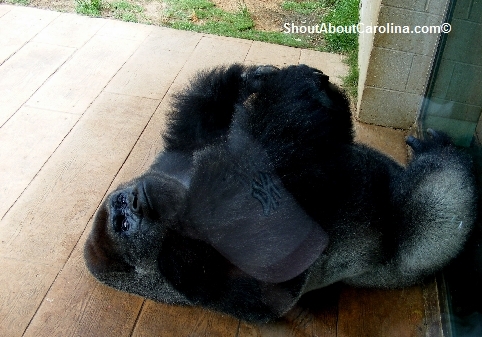 They both have beautiful landscaped gardens, history and nature walks, and guided tours dedicated to the African slaves. 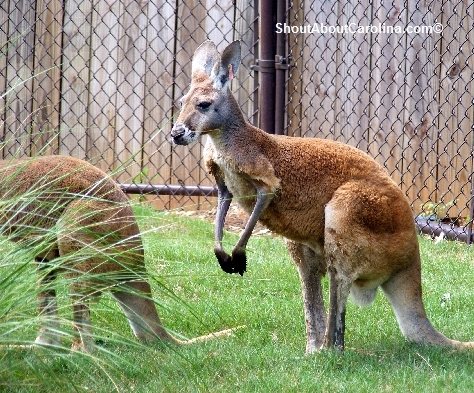 Middleton stands out with its Stableyards, while Magnolia has more activities for kids. 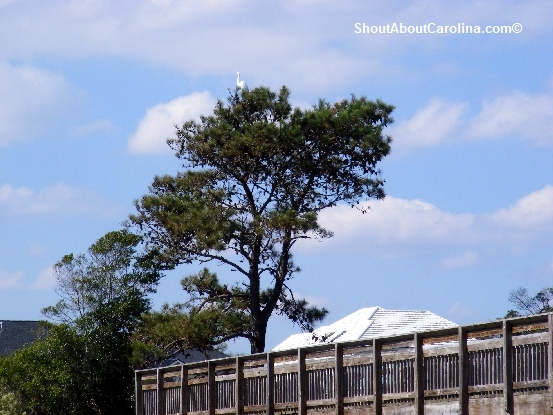 This is an overview of what to expect and things to enjoy on the Middleton Place self-guided walking tour. Just in case, here is a slide show from my visit. • Use the excellent self-guided tour brochure and map you get with your admission ticket (most historic data in this post comes from the brochure)! •	Wear very comfortable shoes. You will be walking or standing on your feet for hours. Have sunscreen, bug spray and plenty of water. •	The place is swarming with flying insects. My daughter got stung by a hornet near the buffalo pond at the Stableyards. Best to wear lightweight long sleeves shirts, pants and a sun hat. • For food you can bring your own picnic, or purchase sandwiches, salads, ice-cream and drinks at the Garden Market. The Middleton Restaurant serves lunch daily 11AM – 3PM and dinner Tuesday to Sunday. For dinner reservations call (843) 556 – 6020 ext. 118. 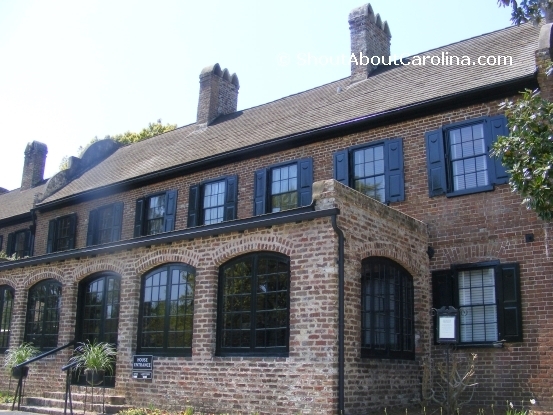 •	The guided House Museum tour is extra $10, runs from 9:30AM to 5PM and lasts about 25 minutes. Note this is not the original 18th century plantation house, but the restored gentlemen guest wing. The only thing left from that period is the south flank. Everything else was destroyed either by fire in the Civil War or the Great 1886 Earthquake. Inside there are original Benjamin West family portraits, Charleston-made rice beds and fine English silver. Further, through August 30, the museum features the “Carolina Gold from Rice to Riches” exhibit. Best place to have a picnic and let the kids run free is at the terraces. The gardens were designed by Andre´ le Notre, the landscape architect of Versailles. The formal lawn provided a reception area at the house east entrance. Many visitors came by boat. Legend has it in 1786 the French botanist Andre´ Michaux gave the Middletons the first four camellias to be planted in an American garden. Now you can relax among “Queen of Flowers” camellias, azaleas, tea plants, magnolia trees and gaze upon the picture perfect Butterfly Lakes or the timeless Ashley River. 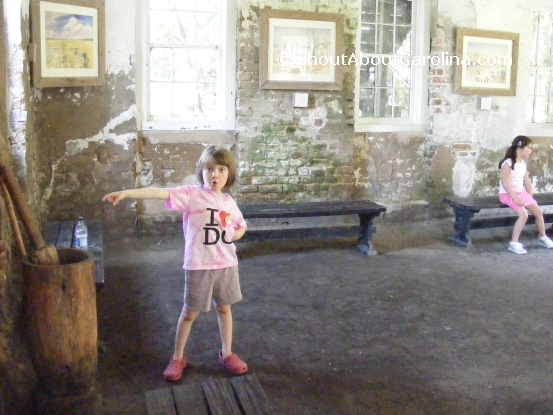 Most popular place for kids inside Middleton Place is the Stableyards. Here you can watch live demonstrations by artisan craftsmen, play with colonial time farm equipment and carriages and see, pet and even milk (some days around 4PM) the animals! Check out these pictures for a detailed Stableyards tour. 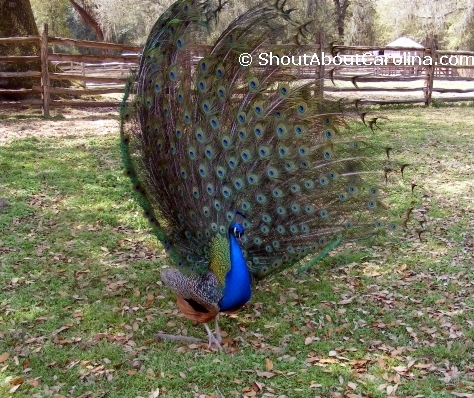 This was my first encounter with a male peacock in a full fledged feather dance. It was impressive! My daughter loved the kitty sleeping in the Weaving room. Everyone was eager to pet the majestic Suffolk horses, that are used today on all the carriage tours. and the Rice Mill Pond Bridge. The hillside was planted in the 1920s with thousands of spring blooming azaleas. 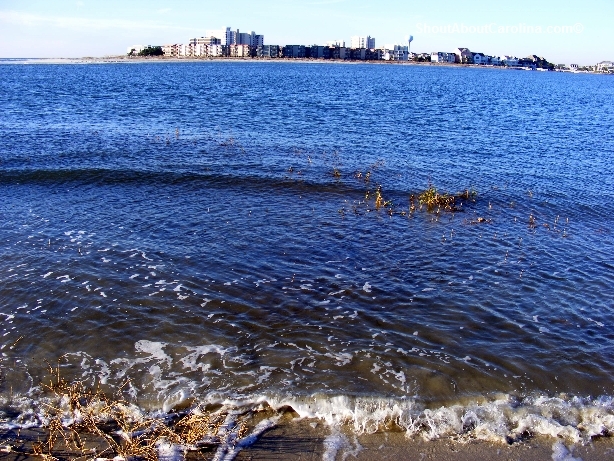 The pond formed after a creek that flowed into Ashley River was dammed. Nowadays geese, swan, wood ducks and mallards swim at ease under the picturesque cypress bridge. 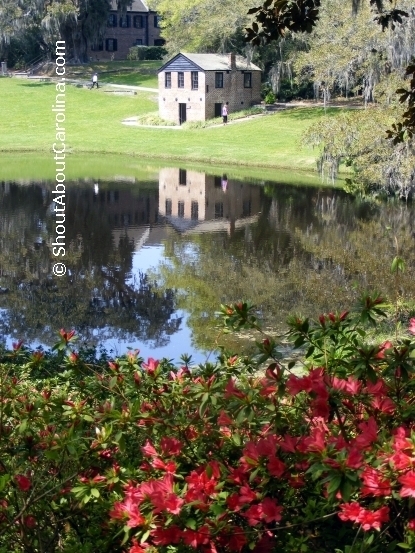 Across Rice Mill Pond is the Spring House and Plantation Chapel. At the lower level, spring waters provided cool storage for dairy products and other foods. The upper floor, added in 1851, was used as a chapel for the slaves until the Civil War. Learn about rice farming, the Carolina Gold crop! Rice cultivation flourished in the 18th and 19th centuries with the labor and skills of thousands of enslaved Africans. After the Civil War it declined. Today “Carolina Gold” is being grown in the demonstration rice field located next to the Rice Mill. Water played a vital role in the economic life of the plantation. 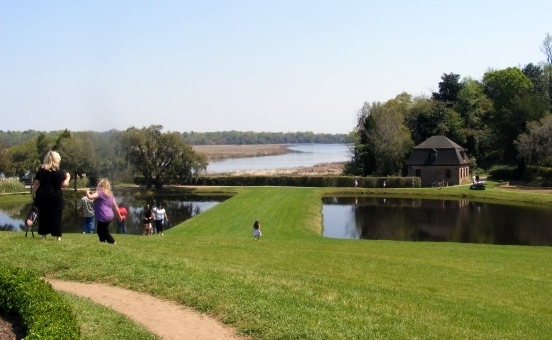 Ashley River was the primary highway to and from outside world for Middleton Place residents. While water was essential in cultivating rice it also provided power for the mill. Milling was the final step in rice processing. The underwater turbine turned a horizontal spiked wheel, from which a belt moved through the two holes in the west wall to power the mill. Most romantic place is around the Reflection Pool (where the self-guided tour starts). 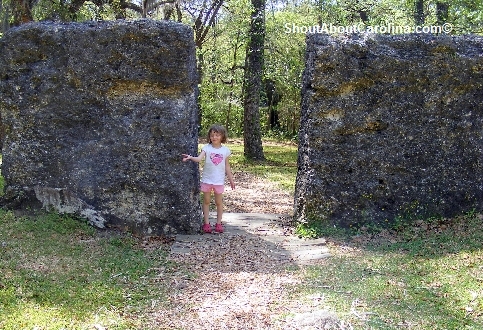 Here you can admire the Secret and Sundial Gardens, the Wood Nymph, one of the few original statues that survived Civil War, and the gigantic Middleton Live Oak that once marked a pre-colonial Indian Trail. Here are more reviews from travelers on Middleton Inn and Restaurant, Middleton weddings, and the Museum House and Carriage tours. The Great Swamp Sanctuary is South Carolina’s newest nature-based attraction providing the ultimate Lowcountry experience: a pristine black waters swamp filled with history, culture, recreation and education. The swamp is located within the ACE Basin and its entrance is just minutes from I-95. At 842-acre, the Sanctuary is the East Coast’s largest estuarine preserve featuring the only “braided creek” swamp accessible to the public. The swamp consists of hardwood flats abundant with wild turkey, deer, raccoons, otter, mink, opossum, squirrels, fox, and wildcats. 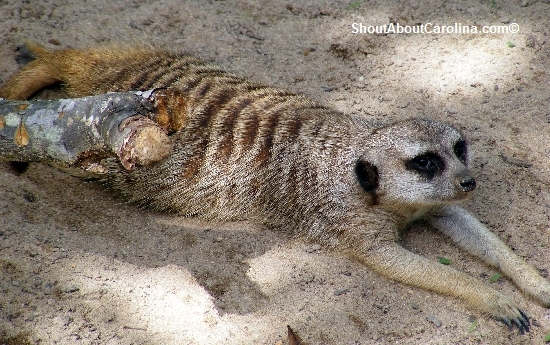 There is a variety of song birds, wading birds, ducks, and predator birds. Bird watching – Over 80 species have been observed including wild turkeys, wood ducks, warblers, wood storks, pileated woodpeckers, bald eagles, accipiters, buteos, falcons, owls and kinglets. 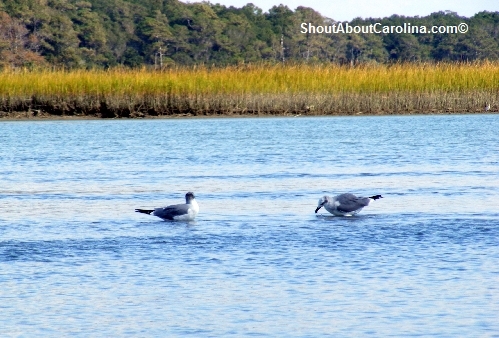 Hiking, walking, jogging and bicycling – There are miles of overland trails and boardwalks crossing the braided streams and the historic Charleston to Savannah wagon road. A bicycle path follows an existing easement that will become a part of residential and the historic downtown area. 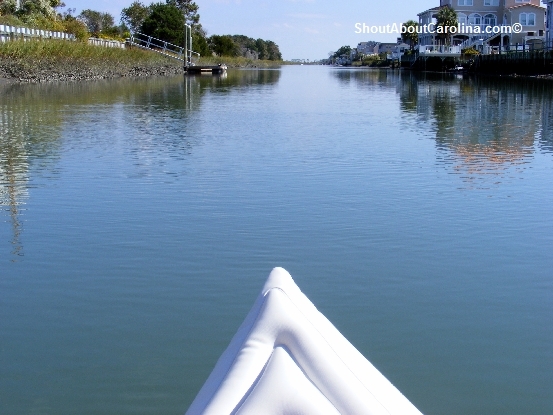 Canoeing and kayaking – 1.5 miles of Ireland Creek are navigable by shallow draft boats allowing you to enjoy the sanctuary or to learn to canoe in relative safety. 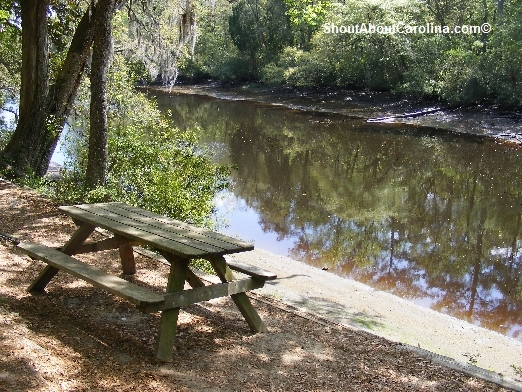 Lowcountry Preservation – The headwaters of the Ashepoo River originate in the sanctuary. The Charleston to Savannah wagon road runs through the heart of the sanctuary. The decayed wooded bridges have been replaced with boardwalks and the road bed has become an integral part of the trails. Now you can traverse the Old Wagon Stagecoach Road like our ancestors did hundreds of years ago! Once rejuvenated outdoors soothe your spiritual cravings at the standout SC Artisans Center downtown Walterboro. There are new artists showcased every year, from paintings to pottery, from glass to wooden toys. My favorites this time around were the Gullah and Kudzu-based crafts. No visit to Walterboro is complete without a tribute stop at the Tuskegee Airmen Memorial. The Black Bird Men (as feared by the Germans), or the Red Tail Angels (as reveered by Americans) proved to be formidable pilots during WWII raids over Western Europe. Make sure to also visit the Colleton County museum (also free to attend) housed in a hundred year old jail. 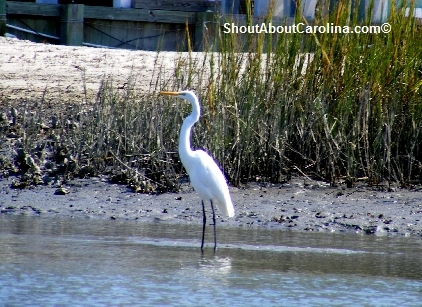 Be proud, healthy and curious in the ever mysterious Lowcountry!